Very high resolution, extreme macros of watches and movements, and panoramic and large scale landscapes and cityscapes. Only watches photographed by the site owner are used. Thus all photographs are exclusive. 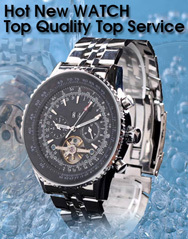 Swiss Watch Emporium - Shop top luxury watches from Switzerland for your collection. Find vintage and modern watch auctions and current deals on the best watch brands from Rolex, Patek Philippe, Breitling, Omega, IWC and more. The Balance Wheel - The balance wheel is a what blog that reflects the heart of the watch enthusiast. All about the watches none of the hype. Focused on watches that don't get the media coverage they deserve.